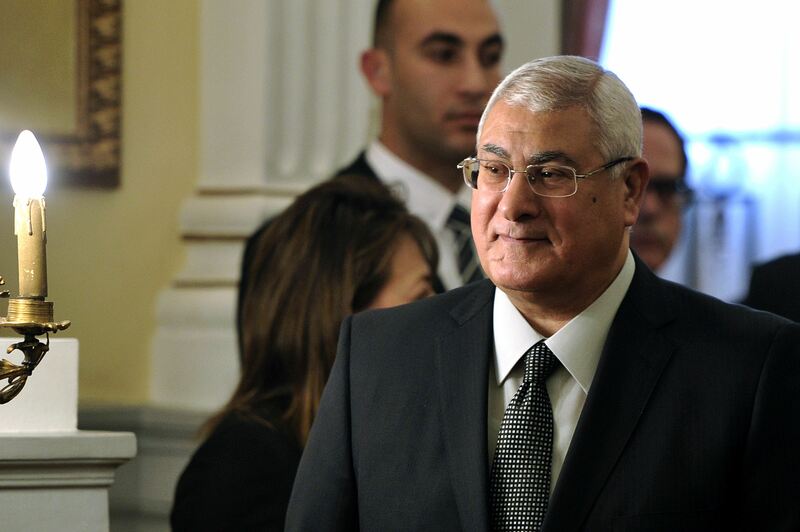 Interim President Adly Mansour addressed Egyptians for the last time as president on Wednesday, a day after former army chief Abdel Fattah al-Sisi’s victory in last week’s presidential elections was officially announced. In his televised speech, Mansour congratulated Egyptians and thanked the Gulf countries for their support. “I would like to pass on the responsibility to the elected president,” Mansour said, adding that he leaves Sisi with serious challenges, but an atmosphere better than that of last year. He warned against “interest groups” who want to restore the old regime and urged the new president to pay closer attention to Egyptian women and their issues. “Human rights are not just about political rights,” Mansour said, adding that the human rights umbrella should also cover social and economic issues. “I wish you all the best with the burden you are about to bear,” Mansour told Sisi. He warned against divisions, pointing to neighbouring countries and their internal conflicts, and directed a word to Egypt’s Christians. Mansour, previously the head of Egypt’s Constitutional Court, was sworn into office last July following the overthrow of elected President Mohamed Mursi of the Muslim Brotherhood.